After putzing around the house for a few hours, I realized the rains had stopped – whatdayaknow. An overcast day is perfect to take flower pics. In the diffuse light, the subtle colors get well saturated. So what the rains over the last weeks had washed out the sakura blossoms. So what all the daffodils wilted in this cold blanketing us. So what we haven’t see the shiny orb in the sky since …whenevah. 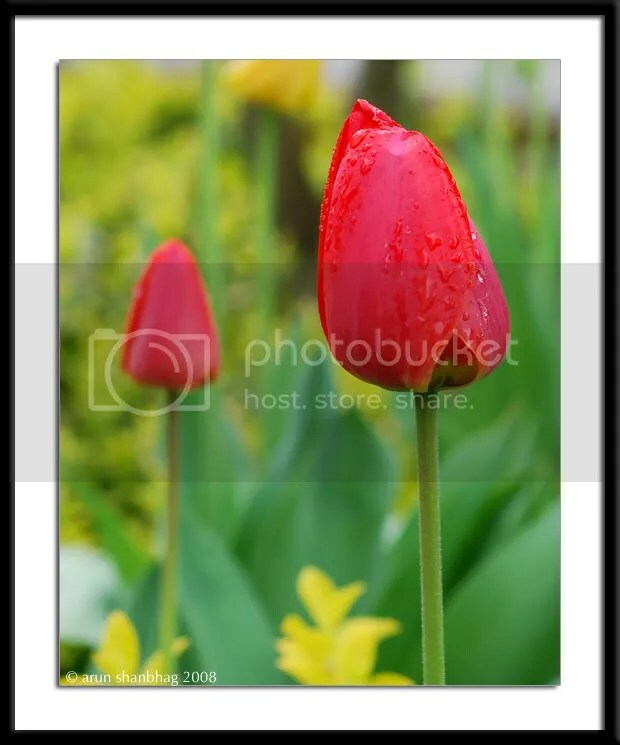 The tulips cloaked in misty droplets, swayed proud. Enjoy this parade. If the Reds can pose, we can too! And dances with the tu-u-lips. Ok, I lied misspoke! 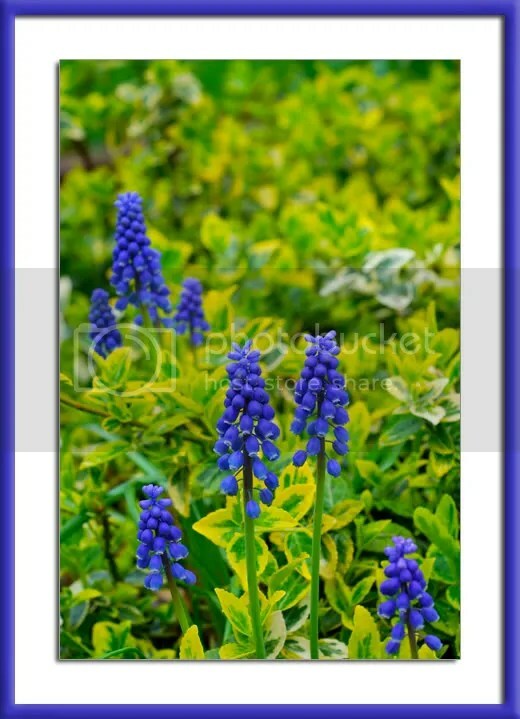 A few Grape Hyacinths! These are tiny! A complete blossom is about an inch and a half tall! You like? You may enjoy these other posts of Blossoms! Will look forward to your Tulip-posts! After Botswana – the tulips here must be heavenly! but I am sure you miss the beautiful continent! Hope you are enjoying the New England Summer? And glad you liked the tulips! Yeah! That header came out good, no!? Lovely pictures! Nice poem too! Wow! Gorgeous shots! Very refreshing!! I love the header on your page! My recovery has been equally fast! Went out for short runs last week and plan of running this evening as well. It is beautiful here! Oohhh! Jasmines! They will last you for every; and the blooms give a nice fragrance to the whole room! Enjoy! Beautiful pictures Arun. Hope you are feeling better and your spirits are back up as usual. 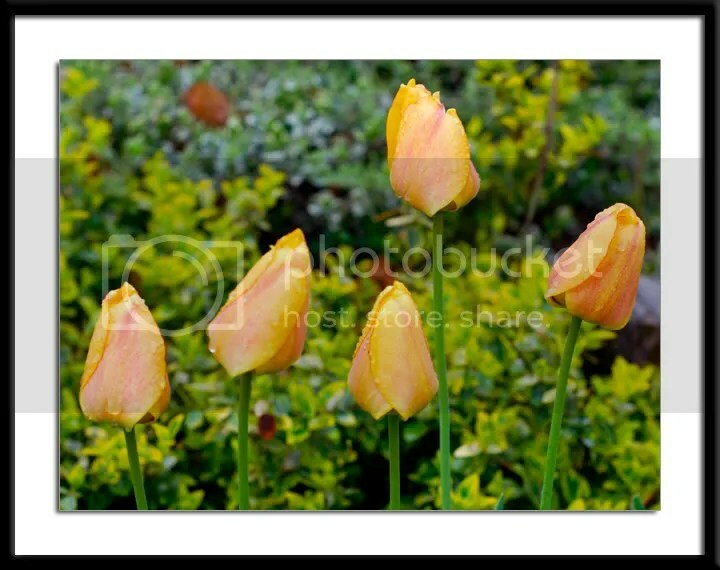 Enjoy the blooms to your hearts content! Download and use as much as you want. Considering the great service you perform with your blog, this it the least that I can do. and Shilpa, check the FLOWERS Tag to bring more color to your desktop. If you need any in hi-Res, let me know. Wow..so beautiful pictures….Wowww….Did i say I have a habit of setting any beautiful picture as desktop background? and did i say I just set 3rd pic as desktop background?? Perhaps its time for a refresher planting in the Fall! Ha hA! Yes, that Swordsworth chap should write more! Amazing pics..Very refreshing . 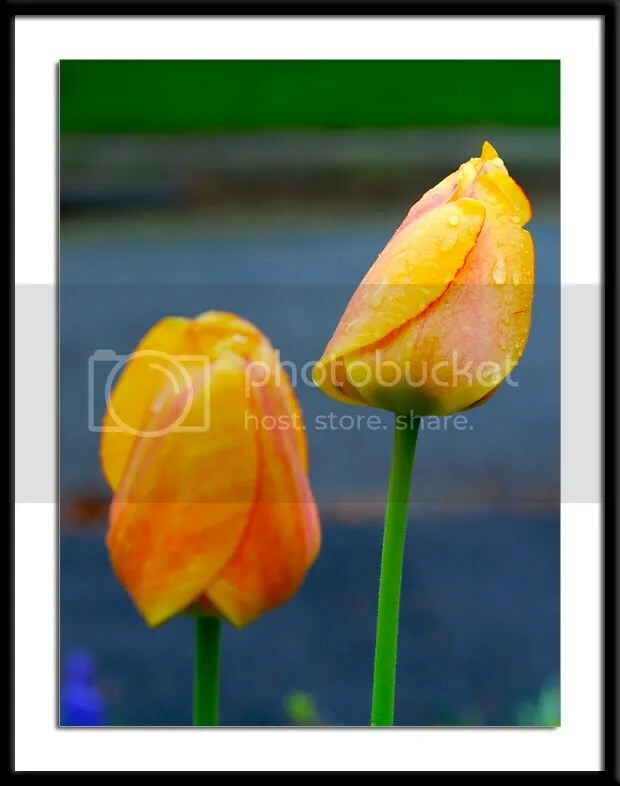 The header looks great with the tulips. The poem by ‘Arun Swordsworth’ is very commendable :))..